As we move our brain into the virtual world our minds react to the false visual rich environment as if the environment were real for our sensory response. The sense of visually induced self-motion appears in concussed people without them being aware that their vection sensing problem exists. The current lack of sensitivity of traditional neuropsychological testing tools has revealed they are not able to discriminate brain dysfunctions in people suffering mild traumatic brain injuries, i.e. concussions. The usual array of brain imaging tools, computerized tomography (CT) and magnetic resonance imaging anatomical scanners, are essentially saying patients are asymptomatic within 10 days following the injury impact. During the 33rd Annual International Conference of the IEEE EMBS in Bostan, Massachusetts during August 30 to September 3, 2011, researchers Semyon Slobounov with Wayne Sebastianelli and Karl Newell presented their study, Incorporating Virtual Reality Graphics with Brain Imaging for Assessment of Sport-Related Concussions. The rationale behind their study showed concerns that, “……visual-kinesthetic tasks are the most common symptom in traumatic brain injured patients having suffered sport-related concussions and that balance symptom resolution varies and may last up to more than one year following injury.” Tellingly, the authors stress, “There is no single concussion alike,in terms of initial symptoms, at the site of injury, therefore in symptoms resolution, as the injury evolves over time.” The group takes the approach to examine multiple modalities, which include, balance, neurocognitive functions and associated neural substrates.” Patients who are essentially asymptomatic from a single concussion event show, ‘residual functional abnormalities.’ The author used a virtual reality graphics system to examine how the brain activation patterns precede the loss of postural stability induced by their ‘ Moving Room’ experimental paradigm. 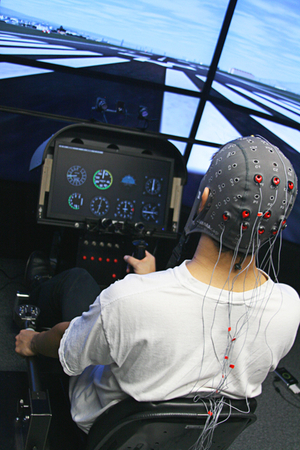 The work involved designing visual perturbation balance tasks by enabling the participants to experience the sense of presence and to track the changing brain activation patterns via EEG comparing both normal controls against concussed individuals during exposure to the Virtual Reality-driven postural task conditions of the Moving Room. In summing up the researchers reflect with, ” The absence of prominent enhancement of central-frontal EEG theta power in concussed individuals, in conjunction with balance problems may indicate impaired neural substrates responsible for focused attention when more challenging postural stance are either required or executed.” Or possibly as I mentioned in the GyroStim essay, maybe their eye muscles are still demeshed from their vestibular anticipation capacity within those critical brain circuits as the pitching or rolling Moving Room affects thier eye tracking capacity. The researchers final conclusion asserts, “….a residual disturbance of the neuronal network that is involved in execution of postural movement.” The authors propose a new Vection Sensing Grading Scale of concussion be considered describing the asymptomatic presence of visual-kinesthetic disintegration induced by visual field motion as detectable altered brain function output.